On February 17, 2013, The New York Times published a fascinating and, quite frankly, damning map depicting the United States’ retrograde attitude toward paid maternity leave in comparison to the rest of the world. 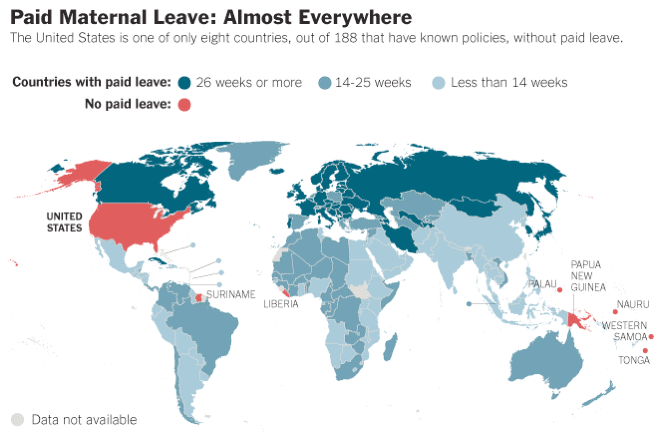 In simple terms, the United States is a global outlier: the only industrialized country not to mandate even a single day of paid maternity leave to its working mothers. While this has been known and publicized for quite some time now (here is a very similar report from National Geographic back in 2007 which was also picked up by the Times), periodic reminders are indeed welcome. As the report demonstrates, in contrast to the United States, Iran’s official policies regarding maternity leave and many other maternal rights are notably progressive. (On the other hand, Iran’s abortion laws, while liberalizing, still have a way to go.) This may come as quite a shock to American readers given the usual media coverage on Iran. The Islamic Republic is perhaps the single most demonized and vilified nation in American politics and media today, depicted almost exclusively as a bastion of medieval barbarity and misogynistic backwardness. As seen in the diagram above, Iran doesn't just have some paid maternity leave, it has one of the most substantial paid benefits policies on the planet for new mothers, setting it apart from the rest of the region and placing it on par with – if not far in advance of – labor laws in much of Europe. On February 20, just three days after The New York Times published this map, the Majlis (Iranian parliament) approved a new family planning bill which, although unfortunately eliminating a number of beneficial birth control programs, actually increased paid maternity leave for mothers from six to nine months, and created an obligatory two-week paid leave for fathers. These benefits outshine most other developing nations. For instance, mothers in India get 12 paid weeks while Brazilian law mandates six months. Turkey stipulates only a 16-week paid leave at 70% pay with an optional six-month unpaid extension, and allows new mothers the ability to “request breaks in the working day amounting to 1 hour 30 minutes per day for breastfeeding” for up to a year. In the United Arab Emirates, private businesses are required to provide roughly 45 days maternity leave at full-pay followed by the same amount of time at half-pay. The public sector offers slightly better benefits with 60 days at full salary. All working mothers in the UAE may extend their leave up to an additional 100 days with no pay. Of course, all of these figures seem unfathomably generous and humanitarian when compared to the United States, which literally stands alone with a begrudging 12-weeks unpaid leave. How’s that for American exceptionalism? I would say Iran's generous laws for working mothers is in line with the traditional Islamic values, valuing motherhood against work for females. Such lengthy paid maternity leaves encourage businesses to employ less women. I don't find it surprising at all. I'm actually surprised that secular European countries have similar policies. The Great Satan, and the world generally, have a lot to learn from the People's Democratic Proletarian Islamic Republic of Iran. According to the 2012 "Global Gender Gap Report", it ranks an awesome 127th overall among countries in the "gender gap" (including 130th in "Economic Participation and Opportunity", 101st in "Educational Attainment", 87th in "Health and Survival", and 126th in "Political Powerment"). If that's not an impressive record, I don't know what is. Afareen, Afareen, Hezar Afareen! I was at a party of Muslimahs awhile back and the girl of the house was just turning 18. She asked the women for advice. I will add, these women were educated women with careers and from all ages. The advice she received was unbelievably wise. They advised she follow her dreams but to tailor her career choices to coincide with having the family, staying home, and then returning at the proper time with minimal educational fuss.